Let me describe in short what I mean. 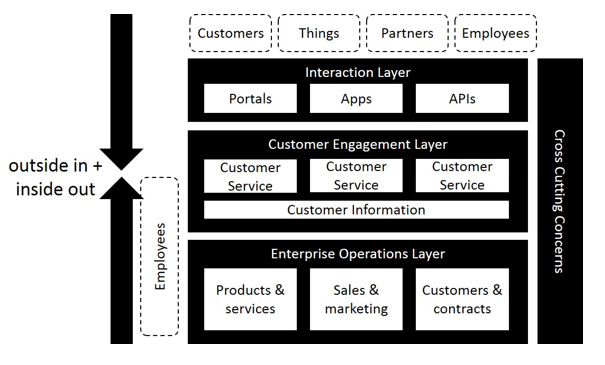 Traditional application landscapes have grown from our internal enterprise processes and are mostly organized along the lines of the functional silos of products & services, sales & marketing, delivery & customer support. They are typically designed to serve a particular type of internal user with a particular functional focus. Over the years, more and more horizontal systems have been introduced to support more transversal enterprise needs for example related to marketing and communication, data warehousing, reporting and business intelligence. To make these systems work together, we have set up different integrations between the vertical specialized applications and the horizontal transversal systems. This has significantly enhanced the complexity of our technology landscapes. But all of these efforts have not changed the fact that most of the current technology landscapes are still mostly designed from the inside out. If we want to transform our enterprises for value creation in the digital world, we need to operate closer to the market, deeply integrating customers, partners and physical products in our business model. This means that we also need to fundamentally transform our technology landscape. We need to think about technology as a platform to digitally connect people, businesses and physical products into value creating networks. We need to start from an outside-in perspective, integrating customers, products, partners and other stakeholders in our value ecosystem in a digital way. It requires us to explicitly introduce interaction and engagement layers to connect with the different participants. 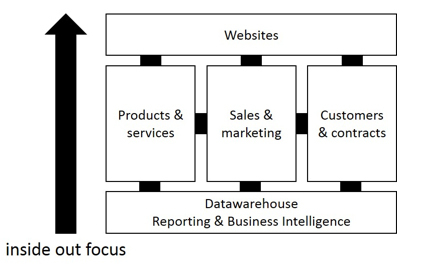 And of course we still need to connect this to the inside-out perspective, to align our internal operational processes with the customer experience and to manage our enterprise data in our systems of record. Next to all of this we also need to think about cross-cutting concerns that we need to address to thrive in a digital world. Concerns for example related to security, integration, insights and analytics, reporting and collaboration. At the same time, we need to remain well aware that we cannot predict and control customer journeys and technology developments anymore. We need to be able to experiment, measure and learn. We need to make sure that we can adapt our platform in an agile way to evolutions and trends in the outside world. I don’t have to tell you that this is a major challenge for many companies. In my upcoming book on value creation for the digital world, I will describe a reference model for digital platforms and a pragmatic approach to implement your digital platform step by step. From the outside in.